The "Norwegian Breakaway" failed a hygiene inspection by the United States Public Health on March 10, 2019, in New Orleans as it only reached 84 of the at least 86 points needed. The inspectors found flies in grill stations and dirty areas in the galleys. The medical department did not comply to all rules for the spread of gastroenteritis. The US Coast Guard medevaced a woman from the "Norwegian Breakaway" in the Gulf of Mexico approximately 230 nautical miles off shore Southwest Pass, Louisiana, on Nov 17, 2018. Watchstanders at the 8th Coast Guard District command center received a report from the cruise ship at 9:15 a.m. of a 64-year-old female suffering from abdominal pain. District watchstanders launched a Coast Guard Aviation Training Center Mobile HC-144 Ocean Sentry air crew and a Coast Guard Air Station New Orleans MH-65 Dolphin helicopter air crew to medevac the woman. The helicopter crew hoisted the woman and transferred her to West Jefferson Medical Center in fair condition. 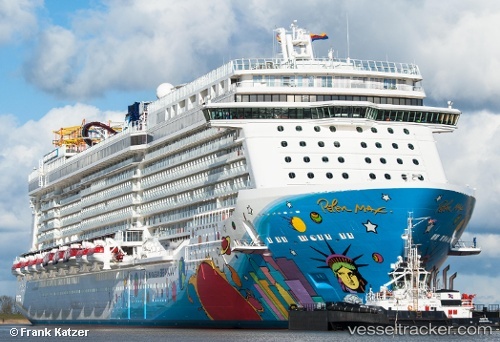 Louisiana’s Port of New Orleans is to welcome its largest-ever homeporting ship on 11 November when Norwegian Cruise Line’s Norwegian Breakaway arrives to start her Caribbean season. The 145,655gt Norwegian Breakaway, which was renovated with refreshed staterooms and public areas this May, is 1,068 feet long and accommodates 3,963 guests and 1,657 crew members. The vessel will also be the newest ship to sail from the port this season.